Hello shoe lovers. Ready for the possibility of an amazing night out. Chinese Laundry is giving you the chance to really show off those new fab shoes you just got with night out at a great concert in celebration of launching their new music series. 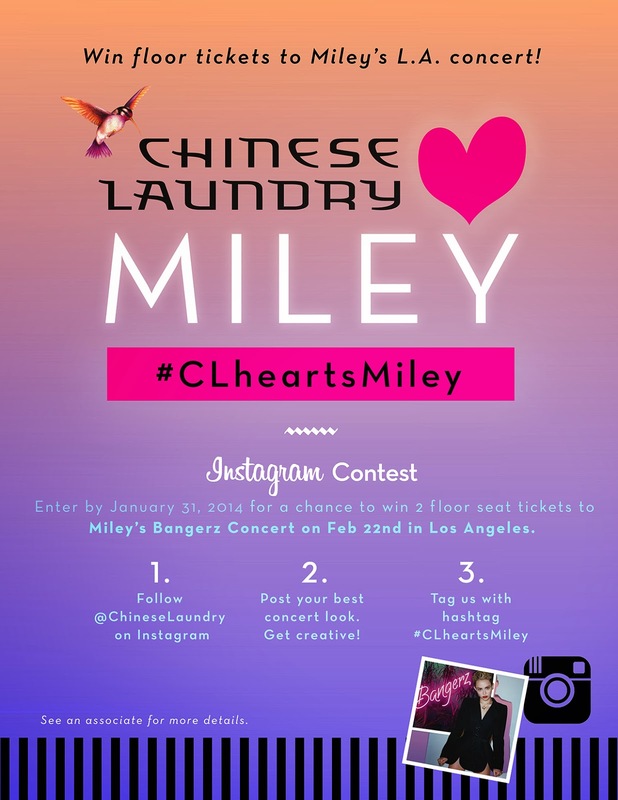 Imagine having floor seats at the concert of your favorite artist; thanks to Chinese Laundry, you can. The first concert for which they will giving out tickets is Miley Cyrus’ upcoming Bangerz Tour. 1. Follow @ChineseLaundry on Instagram. 2. Post your best concert look. Get Creative! 3. Tag your photo with hashtag #CLheartsMiley. 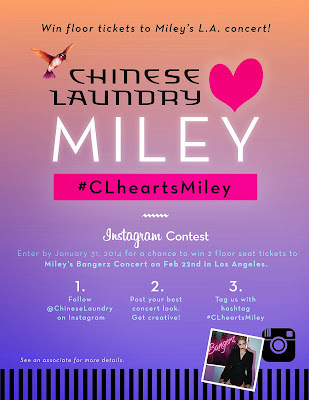 Entries can be submitted through all social channels but you MUST use hashtag #clheartsmiley to enter. And again, entering is easy, just upload your best concert outfit selfie through the Facebook app found here - http://bit.ly/L7ECWI or via Twitter or Instagram. You can submit as many photos as you like by the submission end date. Finalist will be announced on January 31st. Grand prize winner will be announced on February 7th. Good luck everyone.